Running a batch script which will compile my codes and encapsulate in a zip file.Copy the zip file to a remote linux server.At the linux box, I need to deploy my application by unzipping the archieveAnd finally running other commands to manage something more.Problem was I was not sure about how to initiate a command in my linux box from windows batch script. Finally found plink with the help of Mr.Yann Ramin in stackOverFlow. logging in to the remote server Changing directory to where the script file resides [cd /home/user/Documents]running the shell script [./doTheJob.sh]Note that how we are concatenating multiple shell commands in a single line by separating with semicolon. In my development environment I need to access Command Prompt very frequently. And its really boring to open the console and every time do some cd.. cd.. cd and point it to my destined folder. Nothing much to do though... Just download the registry file. Then a “Double click”, followed by “Yes” and “OK”. And it will bring the command prompt in your folder's context menu. If you are using windows Vista or later, you already have this available. But now XP users will also avail the facility. Now, Just right click on any of your folder and click "Command Prompt Here". The file is available through my Google doc shares. Download CMD_Here.reg. Now as we know how to create a project and already met the containers, we can start writing our application right away. And for this we will need to have a little concept about some basics of starting up an application. So today's post is on some elementary stuffs. May seem little bit boring but yet required!! I will not repeat the words already said in bada API doc. I put the links of API doc with each description. Please read the doc and find some additional concerns in this post. 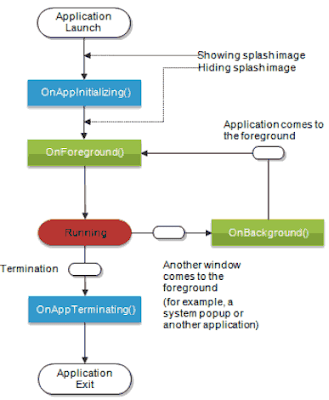 First lets look at the following state diagram of an application. Fig: Application life cycle. Collected from bada API doc. Yes, today we will be looking on to all the containers. Because whatever application you develop you must need to deal with various types of containers. After all containers are the things that will hold all our component and show those on the screen. Lets look at the following picture. 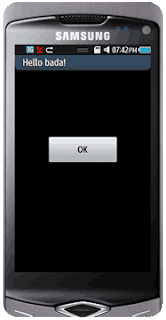 A total black window and a button saying "OK". ( Focus on "Frame" and "Form" only ) So you identified the "Frame" and "Form", right ? ( encircled ). So! Now we are totally ready to go for the sample applications right? Its really easy and fun at the same time. Hope the BADA IDE is running behind your web browser. Now all you need to do is follow the steps given here to run some sample applications. Playing with these applications will make you familiar with this IDE, as well as give you a brief idea over the BADA SDK. Anyway, lets stop my tattling and start working. 1. 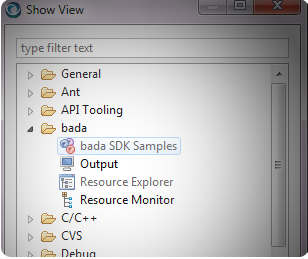 Open the window of BADA SDK samples window. Go to “Window > Show view > Other”. This will show you a dialog like following. Select Bada SDK samples from this dialog. Click OK. The window of sample application list is opened. Yes! Samsung presenting a new mobile OS for the smart phones. This is BADA. You can take a look at the press release of BADA. This one is developed on top of the Samsung's legacy operating systems, but with a target for providing high end smart phone features. Besides, this is open for developers in the whole world. Just register in developer.bada.com and get joined with BADA community. Develop your smart application for your Samsung Smart phones and let others have fun with the excellent BADA applications. Here is the BADA developer website ( http://developer.bada.com ). 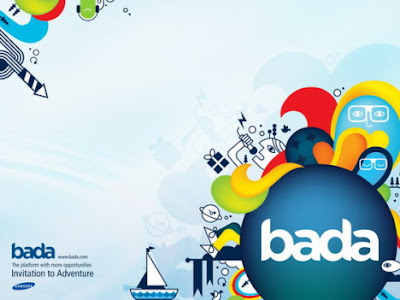 Register there and get connected with lots of resources on BADA and also find very active BADA forums to share your learnings, problems, suggestions and recommendations. Find the forums here. Today I was rambling in my web world on HTML 5. Wondering about the great features offered. I think you also would like to start working on HTML 5 right now. So here are few things that will help to boost up your learning over this.